Birth of a Killer - Darren Shan Wiki - The wiki about all Darren Shan books! 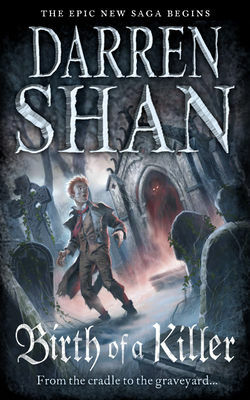 This is the prequel to The Saga of Darren Shan and discusses Mr.Crepsley's life before he became a vampire. The Story begins with, a brief introduction to Larten's family, who live in the 19th century in an unknown location. Larten's family is described as very crowded and poor. He has several brothers and sisters who all sleep in one room and share one bathroom. Larten also lives with his Cousin Vur Horston whos parents have passed away. Our of all his many siblings Larten Shares a strong bond with his cousin Vur. Both Larten and Vur work at a silk worm factory. The factories foreman, Traz is a ruthless tyrant that abuses his young employed children. He dyes there heads, in different colors corresponding to whatever position they work in. Therefore it would be easier to know which child belonged where. Larten's hair is dyed orange since he is a cocooner. Hence, this is why in The Sage of Darren Shan his hair is orange since the dye seeped into his system. His cousin Vur works by his side as well, and is particularly resented by Traz the foreman for being to quick witted. Larten is traumatized by the death of his cousin, it drives Larten into a Mad frenzy and he ends up stabbing the foreman and thus killing him. Shocked by the murder that has happened at his hands Larten runs away never to be seen by his family ever again. He lands up in a graveyard, in where he meets Seba nile who takes him in as his assistant. The book follows Larten's adventures and Seba Niles assistant and his struggles into becoming a vampire. Murlough - Killed all of Wester's family after Wester's father had killed one of his Vampaneze friends. Let Larten survive with Wester. Traz - A cruel foreman where Larten and Vur worked, killed by Larten after Traz had killed Vur. Staffen Irve was the Vampire General at the beginning of Hunters of the Dusk, who reported about the War of the Scars to Darren and Paris Skyle. Yebba was the Vampire who won the howling contest in Trials of Death. When Larten returns to his hometown with Seba and Wester, he sees that the silk factory had been closed, and an abattoir opened in it's place. It is very likely that it is the same abattoir as the one in Tunnesl of Blood. A reference is made to the Demonata series when Larten asks Seba if demons are real, to which Seba answers, "Well, in five hundred years, I have not seen any.". This page was last edited on 26 September 2012, at 14:22.